Here it is, Valentine's day. And am I baking for my beloved? Am I heck! My master plan was to do one of those Dine for a Tenner things (we're not posh enough to have a M&S out here in the sticks). So all the hubby had to do was take plastic lids off of things, stick them in the oven and arrange them on a plate. Unfortunately, my first mistake was to assume he wasn't even capable of making it to the shops to purchase said food. I stocked up on Sunday. Got home. He got grumpy and then finally showed me the note in his iPhone reminding him to go out and forage for an M&S meal today (I'm still not quite sure what he would've done when he realised our closest branch is now in Bristol). So he wanted nothing to do with unwrapping the food I got in Sainzlebobs. He was happy enough to eat it and even happier to down the bottle of red by himself, but cooking it? No way. Anyhow, it meant that for once I got a vaguely decent meal without having to cook. This of course then left me with the dilemma that I hadn't tried a new recipe today. So my lucky lucky work colleagues are being treated again tomorrow with emergency cake, purely because of this now silly challenge I set myself. I'd decided on either Melting Moments from the GBBO book (I adore Viennese Whirls and wanted to try the pretty red-tinged ones that Mary-Anne made) or the Hummingbird Bakery Rhubarb and Almond Loaf from Cake Days. I offered my project manager the choice and he plumped for the rhubarb, citing that it will give him one of his five a day tomorrow. It's an interesting bake. The compote is very runny. Whether it's because of the type of rhubarb that I used or something, but I was expecting slightly firmer chunks. It's also far paler than the rhubarb in the book (although I expect the picture has been photoshopped) so I have a feeling when I cut into it, it won't have the lovely pink marbled effect which will be a shame. There was a lot of leftover compote as well. Which isn't a problem as I love it on my porridge in the morning. I even used more than the recipe said and still had loads left. I gave a tiny taster to the child and now 'RooBAH' is Miss A's favourite fruit. Or is it a vegetable? Judging the cooking time was also hard because with the rhubarb swirled through the middle, trying to tell whether the skewer is damp from uncooked cake mix or just because it's hit the rhubarb motherlode proved difficult. Even after an hour and fifteen minutes (20% more cooking time) it still had a soggy bottom. As pretty as the swirled effect is, next time, I'd consider putting a small layer of just cake mix in the bottom of the tin before swirling the rhubarb through the rest in the hope that the bottom was a bit more stable. The sponge tastes really great with the cinnamon and ginger giving it a lovely spicy note, but I have a feeling that this will detract from the taste of the ground almonds in the batter and the almonds sprinkled on the top. Of course, this is the problem with large cakes. You can't taste test them in advance if proffering them as a psuedo-gift to someone. So I await my project manager's feedback. I have my personal development review coming up next Monday so I will be interested to see if my baking skills have improved this past year. Oh and whether I'm any good at what I'm paid to do too. There's a fair bit riding on this cake so wish me luck! Update: 15th Feb 2012 - well I was disappointed when I cut into the cake. Nary a trace of pink, unlike the (probably over photoshopped) picture in the book. Wondering if it's because the rhubarb is early season forced rhubarb? It also wasn't tart enough for me so next time I'd reduce the sugar in the compote, but that's personal taste. Place the rhubarb together with the sugar and butter in a large saucepan, add 50ml water and cook on a medium heat until the rhubarb is soft. Set aside and let cool. Preheat the oven to 170°C (150°C Fan) 325°F or Gas mark 4. Put the butter and sugar in a large bowl and cream with an electric mixer until pale and fluffy. Add the eggs one at a time and mix until well incorporated. Scrape down the sides after each addition to make sure everything is evenly mixed. Sift the flour, baking powder, almonds, ginger and cinnamon together. Add half of this mixture to the batter and mix well until combined. Add half the milk and mix until well combined. Repeat with the remaining ingredients. 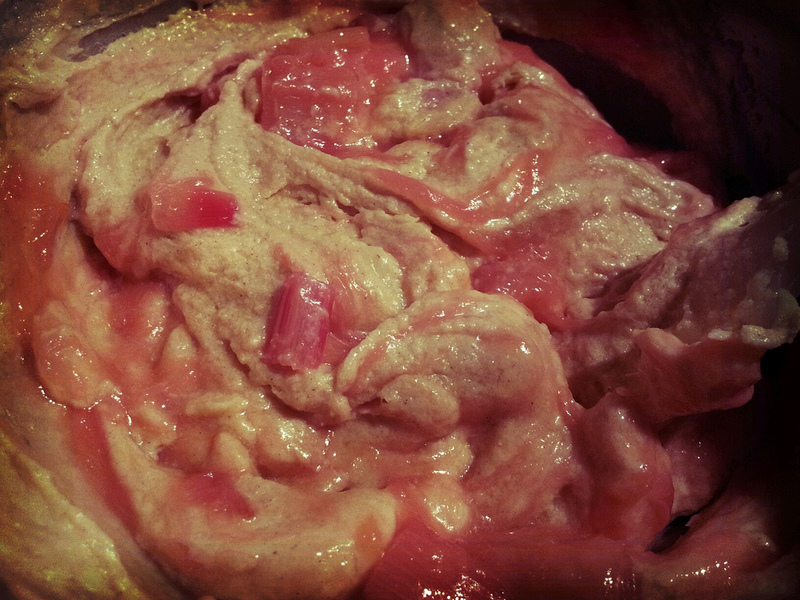 Swirl 100g of the rhubarb through the batter. Sprinkle with the flaked almonds and bake for about 50-60 minutes. Leave to cool in the tin for 10 minutes, then turn out the cake on a wire rack and let cool completely.